Apple's planned deployment of Apple Pay in Taiwan is "coming soon," according to an update on the company's website, with seven banks planned as initial launch partners. Those institutions include Cathay United Bank, CTBC Bank, E. Sun Commercial Bank, Standard Chartered Bank, Taipei Fubon Commercial Bank, Taishin International Bank, and Union Bank of Taiwan, Apple said. The company didn't offer much more information, except to say that Taiwan will get the full assortment of features such as rewards cards and paying on the Web. 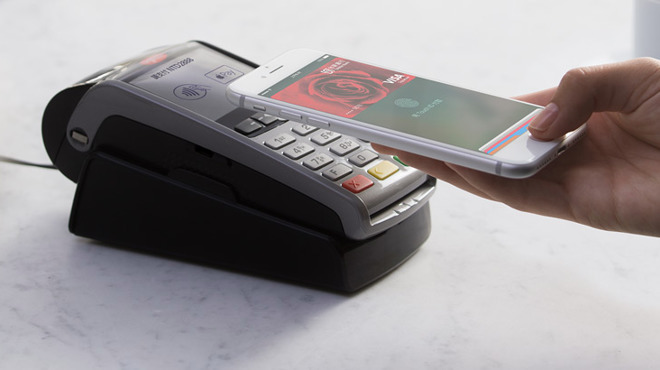 The country is set to become the 14th market for Apple Pay, others being Australia, Canada, China/Hong Kong, France, Japan, New Zealand, Poland, Russia, Singapore, Spain, Switzerland, the U.K., and the U.S.
During a results call on Tuesday, Apple revealed that in part because of international expansion Apple Pay transactions were up 500 percent year-over-year, and that the number of users has tripled. In the U.S., merchant support has been Apple's greatest obstacle. While a number of chains now support the platform, there are still often gaps, and some companies that promised compatibility in the past —such as Anthropologie and Forever 21 —have yet to make the upgrade. Another issue is adoption by small businesses, for which Apple appears to be counting on third-party backends and readers. On Monday it launched a partnership with Square that will let businesses save up to $350 in transaction fees so long as they set up an Apple Pay-compatible reader and various marketing materials.